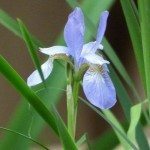 How to germinate water iris seeds in tropical country (Southeast Asia)? Occasionally iris plants produce seed pods but these will take some time to propagate by this method and, therefore, division of the rhizomes is recommended. If you would like to try your hand at starting the seeds anyway, it's at least worth a shot. Collect the seeds as soon as the pods begin to open. Place them in a sealed plastic bag with barely moist vermiculite or soil-less germination mix. Place the sealed bags in a warm area and ensure they remain moist (but not wet). Leave them there until roots appear, which can take anywhere from a few weeks to several months. Once roots appear and are about an inch long, move the bag to a cool location, such as a refrigerator, for about 10-12 weeks, after which pot them up in a soilless germination mix. Note: seeds can also be sown directly in the ground provided the conditions for dormancy and growth are present. However, it will usually take until the second spring before any shoots appear.